Affecting only about 10 to 15 people per million every year, the rare condition, “Cushing’s Disease” can wreak havoc on the body, causing a multitude of uncomfortable and sometimes debilitating symptoms. Cushing’s disease is different from Cushing’s syndrome however. Cushing’s Syndrome vs. Cushing’s Disease—What’s the difference? Though sometimes mistakenly used interchangeably, Cushing’s syndrome and Cushing’s disease are two different diagnoses. Cushing’s syndrome refers to the diagnosed medical condition of elevated cortisol levels in the body. This encompasses all causes for the increased values. In the case of Cushing’s disease however, abnormal cells collect in the pituitary gland and form a tumor. This tumor releases excessive amounts of ACTH (adrenocorticotropic hormone). In direct response, the adrenal glands overproduce cortisol. What are the symptoms of Cushing’s syndrome/disease? 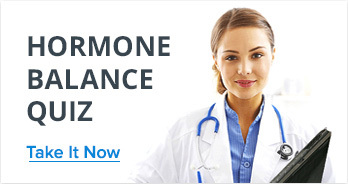 Symptoms specific to women include, menstrual cycle irregularities and facial/body hair growth. Men may experience erectile dysfunction, low libido, and decreased fertility. Beyond the normal symptoms associated with Cushing’s syndrome, certain complications or other medical conditions may occur as a result. What is cortisol and why do we need it? While excess cortisol in the body is unhealthy, cortisol in and of it self is not bad, in fact it is necessary. Cortisol is a hormone, referred to as the “stress hormone” because it enables the body to respond appropriately to dangerous situations. Historically, the hormone was needed to keep individuals safe from physical harm from wild animals and other predators. Cortisol also helps the body convert food to energy, stabilize blood glucose and blood pressure, and keep inflammation down. The adrenal glands, located on top of the kidneys produce cortisol. Who is likely to develop Cushing’s syndrome? In general, Cushing’s syndrome affects adults aged 30-50, however in rare cases, children can develop Cushing’s syndrome as well. While men may be diagnosed with the syndrome, women are three times more likely to have it. 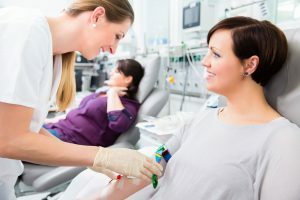 Type 2 diabetics and those with high blood pressure are also more likely to develop Cushing’s syndrome than individuals without those conditions. Cushing’s disease is a rare disorder, affecting adults between the ages of 20 and 50. Roughly 70% of the sufferers are women. Cushing’s disease develops when a pituitary tumor is present and releases excessive amounts of ACTH. This stimulates the adrenals into overproducing cortisol. Cushing’s syndrome is much more common than Cushing’s disease and refers to consistent high levels of cortisol found in the body. 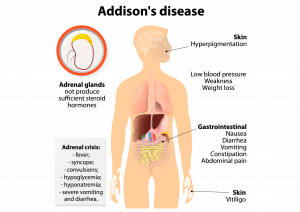 adrenal glands can cause the adrenals to produce too much cortisol. Ectopic Cushing Syndrome—Ectopic Cushing’s syndrome occurs when ACTH is produced outside of the pituitary gland. About 40-70 people per million are affected every year by this type of Cushing’s. Persistent cortisol may exist if medications containing cortisol such as hydrocortisone, prednisone, skin creams, asthma medication and steroid injections for joint pain are used. Glucocorticoid steroids are contained in many medications and mimic the natural steroid hormones the body produces. Cushing’s syndrome occurs when the body’s tissues are exposed to high levels of cortisol for too long. In healthy, normal individuals the hypothalamus, just above the brainstem sends CRH, or corticotrophin-releasing hormone to the pituitary gland located behind the nose. 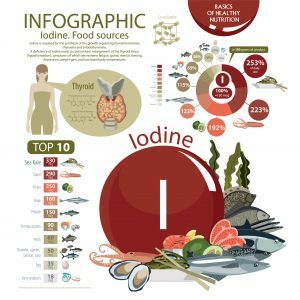 This triggers the pituitary gland’s hyper production of adrenocorticotropic hormone (ACTH) causing the adrenal glands to flood the bloodstream with cortisol. Cortisol performs many necessary functions for the body and without it we would cease to function correctly. Cortisol is necessary to help the body keep blood pressure level, and helps maintain cardiovascular function. Cortisol also helps the body control the immune system and its inflammatory response and works to balance insulin in the body, needed for metabolic processes. Who has abnormally high cortisol levels, naturally? While glucocorticoid-steroid use is the most common reason for Cushing’s syndrome, higher than normal cortisol levels are also common among some individuals. Cortisol levels may be high if you have depressive disorders, anorexia, or high estrogen levels. How do doctors diagnose Cushing’s syndrome? Cushing’s syndrome can be mistaken for other medical issues so thorough examinations and testing are needed to rule out some conditions. Medications taken for inflammation (glucocorticoids) can also cause cortisol levels to soar. A diagnosis of “Cushing’s disease” refers solely to the state of elevated cortisol due to a tumor on the pituitary gland, where the hormone ACTH is produced and released. Cushing’s disease may be difficult to identify in some cases and should be diagnosed or confirmed by an endocrinologist. Treatment for Cushing’s syndrome is dependent on the cause of increased cortisol levels. If this is due to corticoid-steroid medications, doctors may be able to reduce the dosage and manage an existing medical condition in other ways. Causes involving the presence of tumors may be treated with surgery (or treatment to shrink the tumor). Whether you have some or all of the symptoms associated with Cushing’s syndrome or disease, it is critical to get a definitive diagnosis from an experienced physician who works with endocrine disorders. Based on your complete medical history and the reason for a Cushing’s finding, you can proceed with the best treatment option(s) available for your particular circumstances. 1“Cushing Disease: MedlinePlus Medical Encyclopedia.” MedlinePlus, U.S. National Library of Medicine, medlineplus.gov/ency/article/000348.htm. 2“Cushing Syndrome | Hypercortisolism .” MedlinePlus, U.S. National Library of Medicine, 8 May 2018, medlineplus.gov/cushingssyndrome.html. 3“Cushing’s Disease.” UCLA Pituitary Tumor Program, pituitary.ucla.edu/cushings-disease. 4“Cushing’s Syndrome.” Genetic and Rare Diseases Information Center, U.S. Department of Health and Human Services, rarediseases.info.nih.gov/diseases/6224/cushings-syndrome. 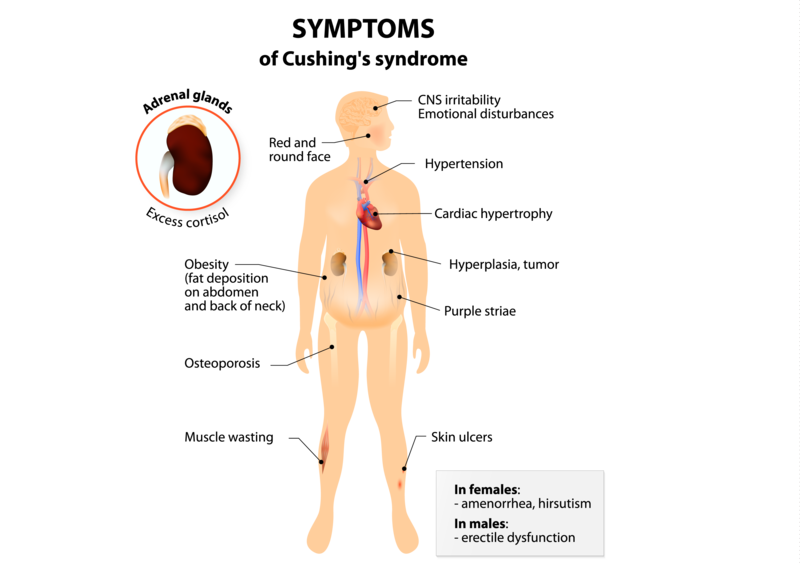 5“Cushing’s Syndrome.” National Institute of Diabetes and Digestive and Kidney Diseases, U.S. Department of Health and Human Services, 1 May 2018, www.niddk.nih.gov/health-information/endocrine-diseases/cushings-syndrome. 6“Exogenous Cushing Syndrome: MedlinePlus Medical Encyclopedia.” MedlinePlus, U.S. National Library of Medicine, medlineplus.gov/ency/article/000389.htm. 7Hyperarts, Rob Mayfield -. “Cushing’s Syndrome.” Endocrine Surgery – Thyroid Nodules, endocrinesurgery.ucsf.edu/conditions–procedures/cushings-syndrome.aspx. 8Owen, Christopher. “MGH.” MGH Neuroendocrine and Pituitary Tumor Clinical Center, pituitary.mgh.harvard.edu/CushingsSyndrome.htm.